HUNTERS SPECIAL-get away from the hustle and bustle of the city and relax with seclusion and wildlife. Watch the deer, mountain lion, bear and so much more! The land runs into a large piece of BLM land with approximately 900+ acres. 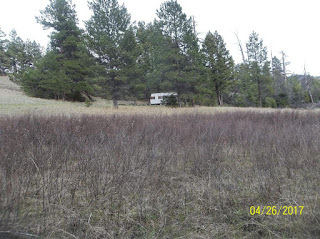 There is a spot made just for your camper to sit comfortably in a nice meadow. Part of the land is timbered with mature trees. There is a creek running through the property. This plot is very peaceful and secluded. Bring your buddies with, this is a total must see! Insured access. Contact Marsha Clark for your private showing today at 406-235-4081. Priced at $34,900.